Sebastian Marokko Walter’s fascination with bees brings him to Bangalore to explore the relationship between humans and bees in this megacity. As visual artist and biologist, he has set his sights on the honey bee. Sebastian M. Walter studied art pedagogics and liberal arts at the State Academy of Art and Design Stuttgart – with Marianne Eigenheer and Daniele Buetti – as well as biology at the University of Hohenheim. His artistic work is closely related to scientific research. Core topics of his art are human perception, evolution and development, as well as the interplay of environment, culture, and society. A current focus of interest are insects and how humans perceive them. After graduation he gained deeper insights into vision research during a stay in Mike Hawken’s lab at the Centre for Neural Science, New York University, NYC, supported by a Herzog-Carl-von-Württemberg stipend. This was followed by several years of intense scientific research on human colour vision, first at the Department of Biological Psychology, Otto-von-Guericke University Magdeburg, then at the Department of General Psychology, Justus-Liebig University Gießen, with Karl Gegenfurtner. Outcomes of this research were published e.g. in Nature Neuroscience, and resulted in various artistic works: For instance, the light installation “Architecture of Light”, Kunststation St. Peter, Cologne (2014), as part of the similarly-titled music theatre project by the Polish composer Prasqual, and recently “Eye [aɪ]“, Städtische Galerie Villingen-Schwenningen (2016). © Sebastian Marokko Walter Some important projects were realised with support of the Art Foundation Schöppingen, within the KWW (Art-Science-Economy) funding programme of the Federal State of North Rhine-Westphalia. For example the installation “Kava Bar Paradise” (2009–10), which was based on results of a DAAD (German Academic Exchange Service) travel grant to Vanuatu, South Pacific, or “Time Spy” (2011–12), a multi-site installation of visual time machines in public space that was realised with participation of local young people, heritage associations, and scientific experts from archaeology and palaeontology. Since 2016, Sebastian M. Walter has been investigating stone-age depictions of animals from northern Mesopotamia at the German Archaeological Institute (DAI) Berlin. Focus of this research is insect figures, which he could identify as probably the oldest known depictions of bees in different developmental stages – nearly 12,000-year-old testimonials of a close cultural relation between humans and bees. During his bangaloREsidency at the National Centre for Biological Sciences (NCBS) Sebastian M. Walter will continue to work on bees. 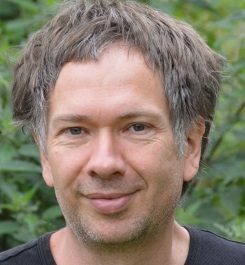 In Axel Brockmann’s working group, he will investigate the behaviour of honey bees. Additionally he will explore the relationship(s) of humans and bees in the megacity of Bangalore. When we arrived in Bangalore, early in the morning at the airport, the interns of the Goethe Institut awaited us with chains of flowers and also my host Axel Brockmann had come to bring me to my new home, an apartment in the NCBS housing complex. Only a few hours later, after a very short sleep, I was sitting in a cab that should take me from the periphery of Bangalore to the Goethe Institut in the heart of the city. Here I could get my first impression of this fast growing agglomeration of buildings, homes, offices, and shops for more than 12 million inhabitants, and the often chaotic traffic. When I arrived at the Goethe Institut, I could only have a short glimpse of the big nest of giant honeybees that was attached to the building on the other side of the street. Then we had to enter the bus for a first tour around Bangalore. The next day was my first day on the campus of the National Centre for Biological Sciences (NCBS). From the first moment I felt somehow at home in the huge laboratory building that was surrounded by a green oasis. On my first walk I found a flowering bottle brush tree. Everywhere on the flowers were bees, different kinds of bees. I saw them for the first time in reality, the three specimens of honeybees that occur in Bangalore: The dwarf honeybee Apis florea, the eastern honeybee Apis cerana, and the giant honeybee Apis dorsata. During the first week I found more nests of Apis dorsata, I was introduced to scientists who work with bees, I got an idea of Bangalore as a city and as a place to live, and I started to gather material for my project: Drawings of bees by children and adults, bee experts and non-experts, interviews with people who live with bees, either by accident or by interest, photographs and sounds of bees and the city. I also collected empty water bottles and other stuff I might need. Suresh Jayaram, the artist who runs 1 Shanti Road, wanted to show me nests of honeybees in the trees of the botanical garden, but we did not find any on this trip. Instead we found signs at the entrances and in the park that were warning of dangerous honeybees. Many of their nests were obviously destroyed, because people are afraid of them. Later I could spot some remaining nests. Hanumantha, a honeyhunter and beekeeper, showed me how to handle bees without getting stung. He found a colony of wild dwarf bees for me, which I could observe during the next weeks until they absconded. The rainy season in September / October was, as I learned, not the best time for observing bees in Bangalore, because during this time of the year, when there is a lot of rain and less flowers, they often migrate to other places, where they find more food. It’s like the many people who come to Bangalore, because they cannot earn enough money with their work as farmers. Now they try to make their living as construction workers, often living in sheds close to or even inside the houses they are building. For others, Bangalore is the place where they can make the next step in their career, in a multinational company or, for example, at NCBS. During my stay I collected many pictures and stories about bees and humans. Part of these images and stories went into a book. Part was also presented in an exhibition at NCBS. Here, the water bottles became a glowing swarm of blue bees. Thanks a lot to the team of the Goethe Institut, Axel Brockmann and his lab, as well as all others who supported me and this project in such wonderful and manifold ways!